Humor is something that is funny, comical, or amusing. There are many types of humor, and what appears humorous to one person may not be humorous to another. Humor can be found in movies and books, in jokes, and in everyday situations of life. 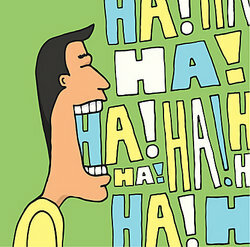 Humor can also describe a mood or a state of mind, as when saying that a person is in a state of good humor. Because laughter is good for us, humor can play an important role in our health. What time does Sean Connery arrive at Wimbledon? Tennish. "Doctor, when my hand gets better, will I be able to play the piano?" "Of course" said the doctor. "That's great. I could never play the piano before!" How did the hipster burn his mouth? He ate his dinner before it was cool. What do you call a Frenchman wearing sandals? Philippe Philoppe. Two whales walk into a bar. The first whale says to the other, "WOOOOOO. WEEEEEEEEOOOOO. WEEEEEEEEEEEEOOOOOOOOO." The second whale says, "Shut up Steve, you're drunk." "Did you know it takes three sheep to make a sweater?" "I didn't know sheep could knit." Two goldfish are in a tank. One turns to the other and says, "Do you know how to drive this thing?" What did the Buddhist monk say to the hot dog vendor? "Make me one with everything." Two guys are out walking their dogs on a hot day, when they pass by a pub. The first guy says "Let's go in there for a pint." Second guy, says, "They won't let us in with our dogs." First guy: "Sure they will, just follow my lead." He goes up to the pub, and sure enough the doorman says, "I can't let you in here with that dog." He replies, "Oh, I'm blind and this is my seeing-eye dog." The doorman says, "Ok then, come on in." The second guy sees this and does the same thing. He goes up to the pub, and the doorman says, "You can't come in here with a dog." He replies, "I'm blind and this is my seeing-eye dog." The doorman responds, "You have a chihuahua for a seeing-eye dog?" The second guy stops for a second, and exclaims, "They gave me a chihuahua?" Why does a chicken coop always have two doors? Because if it had four doors it would be a chicken sedan! If you visit the National Air and Space Museum you might think the title is misleading, because it is actually full of stuff. Who is the roundest knight at King Arthur's table? Sir Cumference. All the passengers are seated on a plane out on the tarmac and the stewardess announces "We're just waiting for the pilots." The passengers look out the window and see two men, dressed as pilots walking towards the plane. Both men are using guide dogs and appear to be blind. There are murmurs among the passengers, and some believe it is a joke. The men board the plane and go into the cockpit. More concerned murmurs and uneasy chuckles from the passengers. The plane taxis normally to the runway and begins its takeoff. As passengers look out the window they realize they are nearing the end of the runway. The entire passenger cabin begins screaming but the plane lifts off just before the end of the runway. The passengers calm down and chuckle to themselves. In the cockpit, the pilot turns to his copilot and says "You know, one day those people are gonna scream too late and we're all gonna die!" Did you take a bath today? No. Is one missing? What do you get when you cross a cow and a duck? Milk and quackers. What's the difference between an egg and a skunk? If you don't know, remind me never to send you to buy eggs. What must you do before getting off a bus? Get on it. These are all jokes that people have found to be examples of humor. "Examples of Humor." YourDictionary, n.d. Web. 18 April 2019. <https://examples.yourdictionary.com/examples-of-humor.html>.